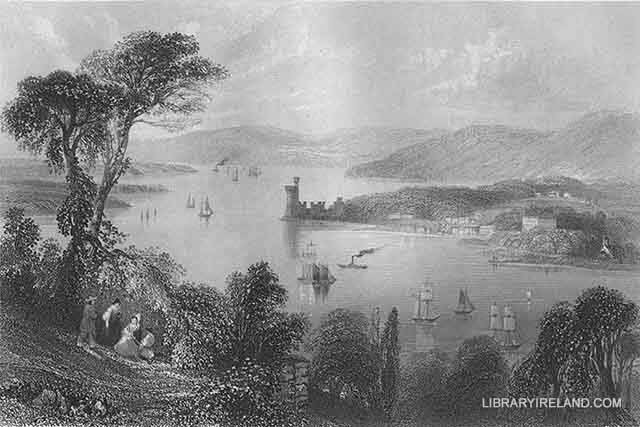 Although several splendid views may be obtained of the Harbour and River of Cork from different points on the land, the tourist who wishes to behold them in perfection will step on board a boat, or one of the steamers which ply between Cork and Queenstown, as this course gives a perfect command of the picturesque scenery on both sides of the river with infinitely superior effect. Arthur Young, an intelligent traveller, who visited Cork at a time when the shores of the river had received little improvement from the hand of art, remarks, "that the country on the harbour he thought to be preferable in many respects to anything he had seen in Ireland." Inglis bestows on the scenery the full tribute of his admiration. And Milner speaking of it says, "that neither the Severn at Chepstow, nor the sea at Southampton, is to be compared to it." Another writer adds, that "no part of the scenery is barren or uninteresting; a perpetual variety is presented along the whole course. The eye, whilst lingering over some happy picture, is continually attracted by some new succession, possessing all the charms of the most romantic landscape." Leaving the quay at Queenstown, we pass the islands of Spike and Hawlbowline; the former is the larger and more important. It faces the entrance of the harbour, and acts as a breakwater to shelter it from the violence of the southerly winds and the strong flood-tides. It is also happily situated for the defence of the harbour, and has been strongly fortified for that purpose. This island is at present garrisoned by a small military force. Hawlbowline is a small, rocky islet to the west of Spike, which affords the same protection to the vessels in the harbour from the strong ebb-tides that Spike Island does from the flood. The fortifications of Spike were formerly under the direction of Colonel, afterwards General Vallancey, who, though an Englishman, devoted his whole soul and great talents to the investigation of the early literature and antiquities of Ireland.